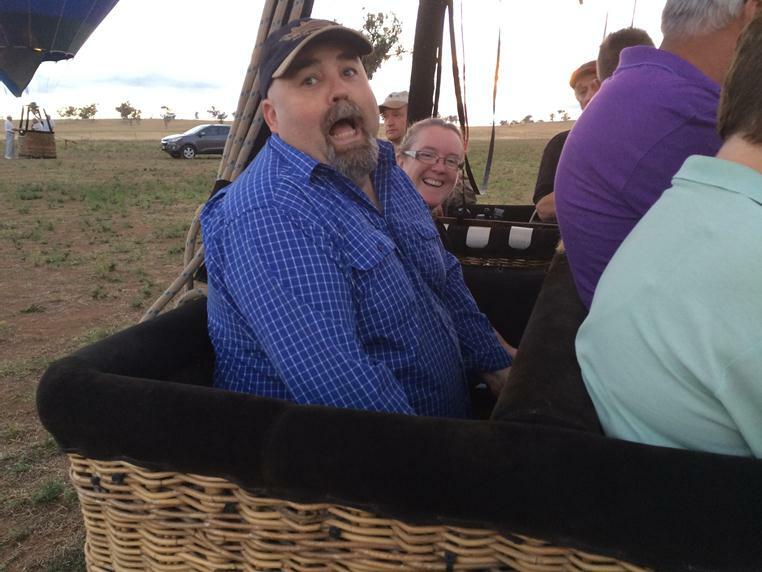 Dr Alex Ritchie is a Palaeontologist, Senior Fellow at the Australian Museum of Natural History and the ‘Father’ of the Canowindra fossils. 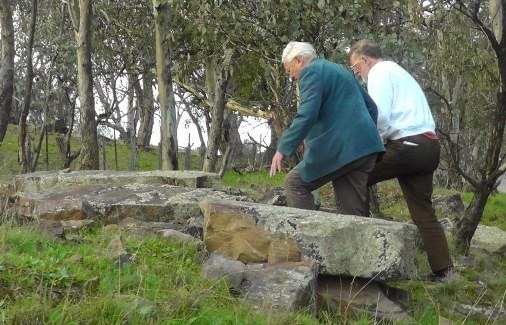 In January 1993, after a 20 year search, an exploratory dig by Dr Alex rediscovered the source of the 1955 fossil fish slab and with local community support and earth moving equipment (provided by Cabonne Shire Council), he supervised the 10-day major excavation of this world-class fossil fish site. 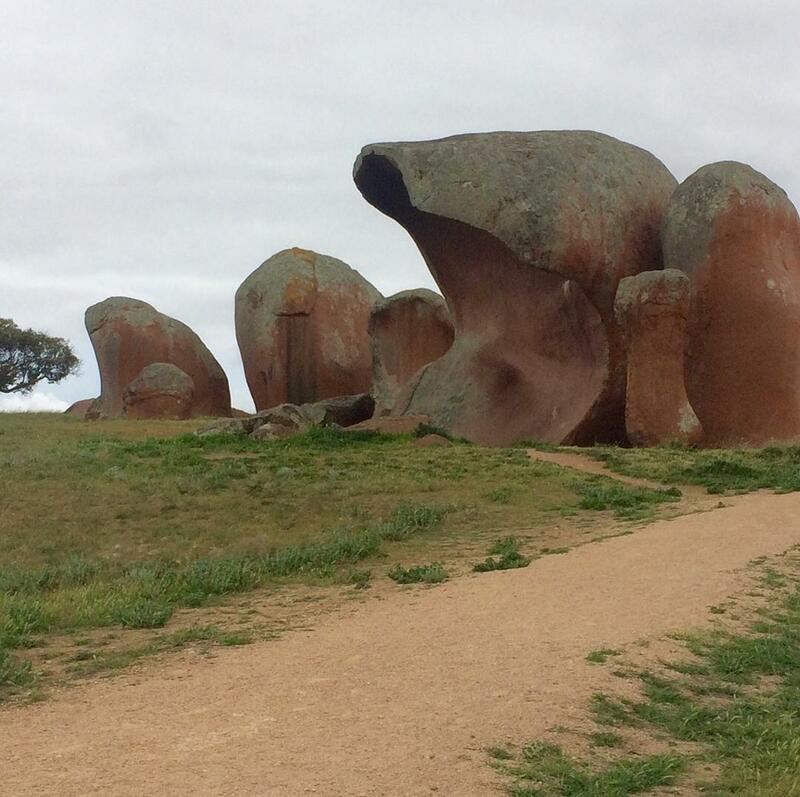 The find exceeded all expectations with some 70-80 tonnes of rock slabs, containing around 4,000 fish specimens recovered from the Canowindra site. Thousands of complete fish specimens still remain buried at the original site, awaiting excavation. These could well include other animals new to science and possibly even the skeletal remains of some of the earliest known amphibians, our distant ancestors – a world class thrilling prospect not just for Australia but the international science community to anticipate! 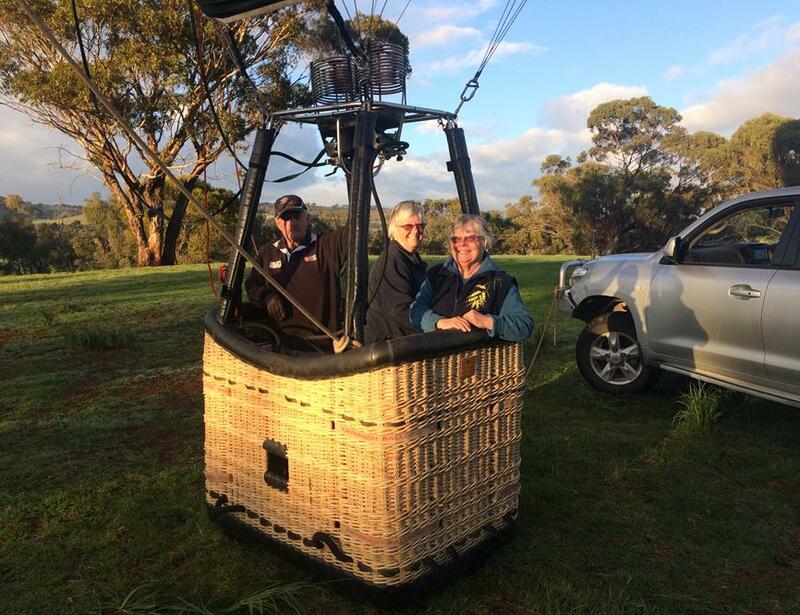 Volunteers to the Age of Fishes Renate and Colin have recently returned from their trip to Northam,Western Australia for the Australian National Balloon Championships held there in September this year. 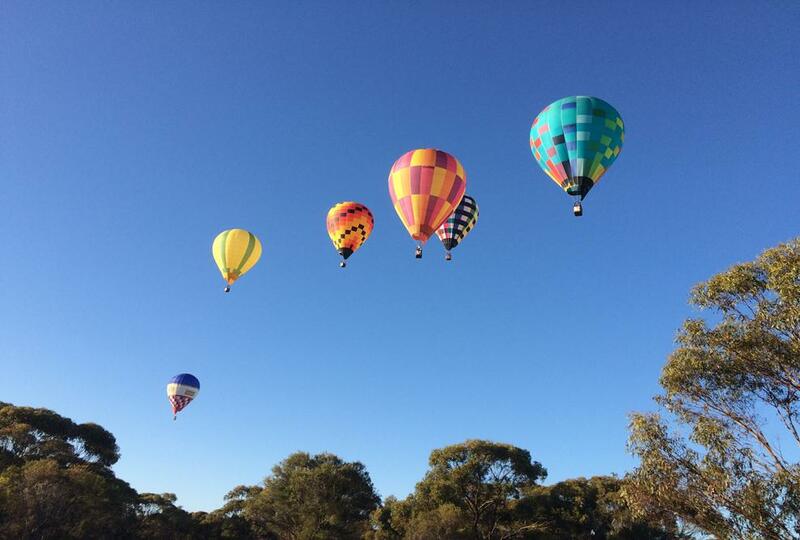 On their way home they travelled around the south western corner of West Australia. 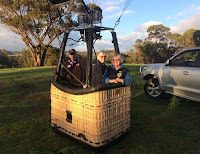 Though the trip was originally intended to be three to four months duration sadly the weather in Western Australia had other plans leaving a fine (thankfully) 2 weeks in Northam for the competition (Crewing for Anton Kerr along with Matthew Rice, plus Jan & Graham Kerr of Balloon Joy Flights). Along with the Kerrs (Jan & Graham), Renate & Colin headed for the Margaret River region via Fremantle for a few days R&R. While the weather was great they went on winery crawls and visited cheese and chocolate factories. While Jan and Graham had to head home to business. Renate and Colin continued on with sight seeing and the occasional cave visit. 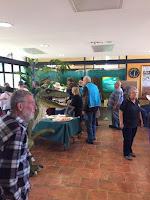 Eventually heading down to Walpole and Albany, when the heavens opened they did an did an Eco Cruise on the Nornalup inlet where the guide, an interesting man with a sound knowledge of Australia's geological history started talking about a large fish fossil find in central NSW. 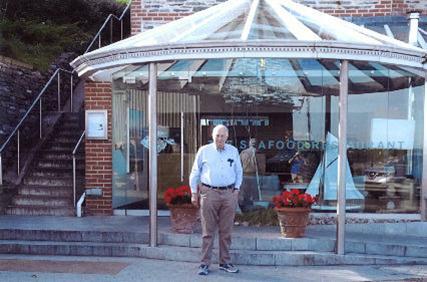 When he expressed he would love to learn more about it, Colin was happy to inform him that one of his tasks at Age of Fishes Museum is as a tour guide. 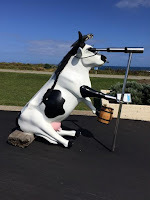 This was enough to get their guide very exited and asking a zillion questions about our museum in Canowindra. Albany was a washout. They were there for just over a week and it poured every day. In one 24 hour period they had 80mm plus of rain. 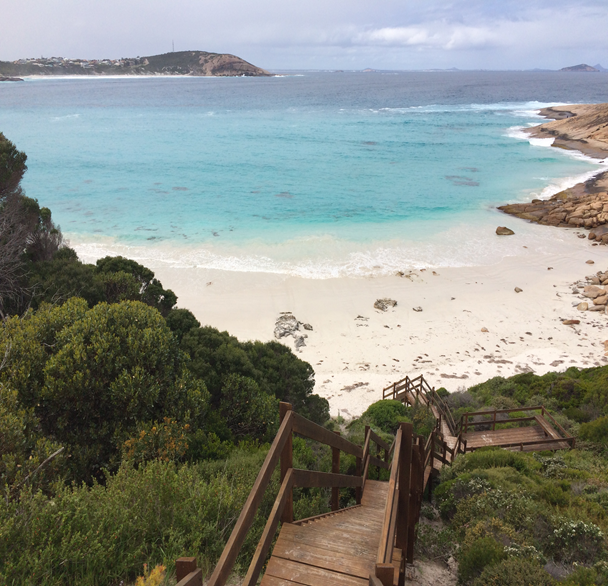 Though hoping for a drier time in Esperance it wasn't to be and upon leaving Albany they were diverted to detours due to road washouts. 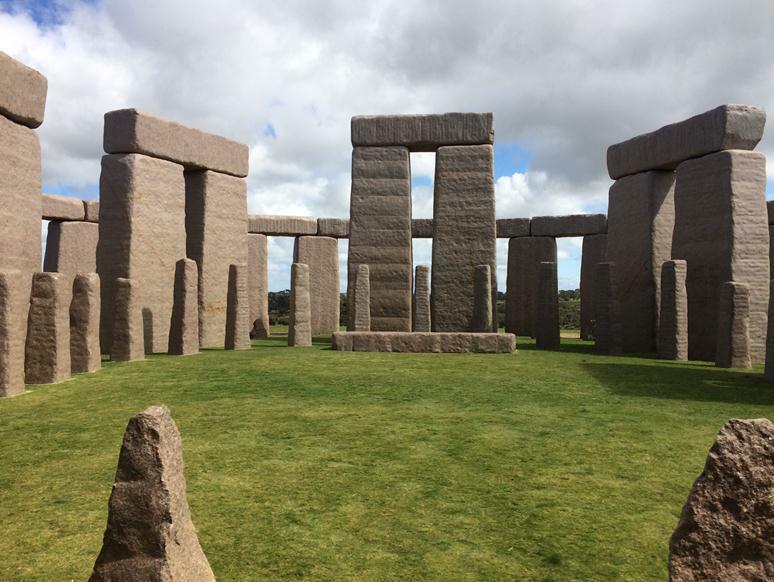 On one fine one day though they were able to see went “Stonehenge” a granite replica of the original henge on England's Salisbury Plain, reproduced down to the finest detail. Worth a look if ever you are there. The bad weather followed them back across the Nullarbor to South Australia and though they had intended to go into the North Flinders Ranges it was decided to abort the rest of the trip and head home arriving with the rain in tow, a dry and thirsty Canowindra thanked them. John & Lorraine’s Excellent Adventure. Age of Fishes volunteers John & Lorraine recently spent 5 weeks in the UK. On arrival three days were spent in London recovering from the flight and to see a performance at The Globe Theatre (a bucket list item now ticked off Lorraine’s list) . 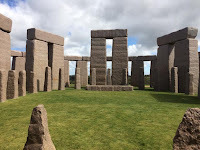 Driving south west over a few days they reached Harlyn Bay (Cornwall) near Padstow where they stayed for the next week and celebrating John’s 80th birthday with lunch at Rick Stein’s original seafood restaurant and lots of day trips to beautiful and interesting locations. Heading north over several days to Montrose in Scotland they visited John’s sister. 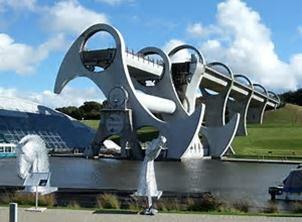 Many day trips were spent appreciating Scotland's magnificent scenery, including the amazing “Falkirk Wheel” which is used in place of eleven (canal) locks, for lifting boats (barges) from one canal to another 30 metres up using about as much power as boiling 8 kettles of water! 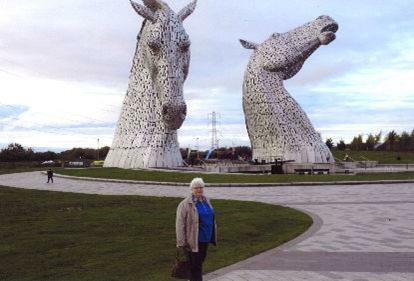 The huge sculptures in the photo are called “The Kelpies” and they celebrate the heavy horses that were used to pull the barges/canal boats before the wheel. Visitor Numbers Have been Good! Recent visitor numbers have been very good at the museum and bodes well for the future. Anne Clark along with her team are setting in motion new initiatives to steadily improve the number of visitors such as mail outs to various interest groups, travel clubs, car & motor bike clubs, probus groups, schools, uni’s etc. The more people we welcome through our door equates to a much wider exposure to other groups and individuals. This also helps us achieve a far better and more cost effective promotion of the Age of Fishes Museum. In September we fare-welled Warren Keedle under whom the museum experienced a wonderful period of economic growth, financial stability and new direction. His introduction of several new initiatives enhanced the experience afforded to visitors to the museum. 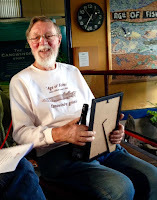 Warren enjoyed bringing in fossils from around the world for sale in the Grossi gift shop and these fossil sales undoubtedly improved both profitability to the shop & the financial stability of the museum in general. The legacy Warren left the Age of Fishes Museum is not only a new attitude to customer/visitor experience which will no doubt live on for a long time to come but also as exciting and inclusive environment. 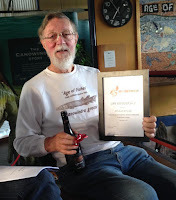 Thank you Warren, thank you for a wonderful journey - you will be very much missed. And so, on 16 Oct 2017 the Age of Fishes Museum takes great pleasure in welcoming Anne Clark to the role of Manager of the museum. With a Bachelor of Science (Agriculture) under her wing, Anne, the author of 12 text books, has not only taught science, biology and agriculture in her years in the standard educational stream but has also taught at TAFE, and the department of Parks & Wildlife. As co-owner of a refrigeration transport business (14 yrs) and currently co-owner of the Adret Pastoral Co. she has experience in budgets, strategic planning & business planning. So with open arms council, staff and volunteers welcome Anne aboard and look forward to a new era of growth and change for the museum with her leadership & guidance. There is a new fish in the pond. As you may or may not know our Fiona Ferguson stepped down from her position as manager earlier this year. 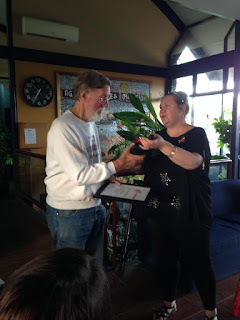 We would like to take this opportunity to thank Fiona for all of her amazing work over the years, as well as her passion and commitment to the museum and the community of Canowindra. Her replacement is well suited to continuing this fantastic legacy. So without further ado we would like to introduce to you Warren Keedle the new “Big” fish in the Canowindra Pond. Warren has a degree in Environmental Science majoring in Cultural Heritage and as such has a strong interest in heritage and history. He has previously worked for large tourism organisations in the Blue Mountains and as a Discovery Ranger and educator with the NSW National Parks and Wildlife Service. He has been involved in several heritage projects in the region most recently the relocation of Emmaville cottage in Orange, where his involvement included writing management plans and assessment documents for the move. 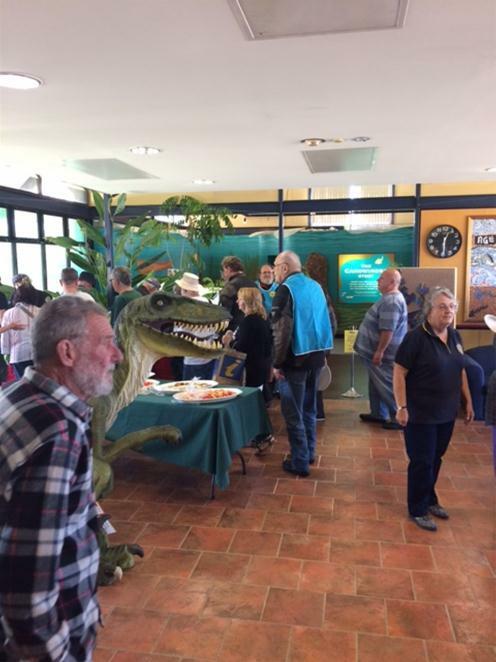 Warren is keen to be part of the progress and development of cultural heritage in Canowindra and is now well placed as the manager of the Southern Hemisphere’s only Devonian fish fossil museum to be an integral part of the future in our town. If you wish to discuss any heritage issues or ideas for the progress of the museum he is more than willing to spend time learning and sharing information. Or feel free to pop in to the Age of Fishes Museum and say Hello. Ed. The Age of Fishes Museum would like to pay respect to the Wiradjuri People, the traditional custodians of the land upon which the museum stands and in which our fossils were discovered, and pay respect to elders past and present. year. Below are some of the exclusive pictures from the visit. 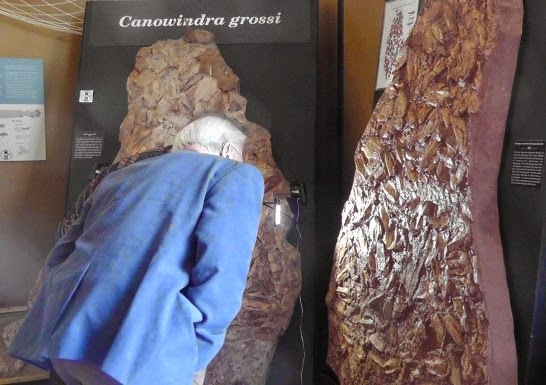 While he was here he was given a private tour by eminent palaeontologist Dr Alex Ritchie, who was integral in the rediscovery of our fossil heritage in 1993. Sir David said that our fossils were “World Class”, and that we were very privileged to have such amazing specimens. Dr Alex Ritchie and Sir David Attenborough examining slabs in the storage facility. 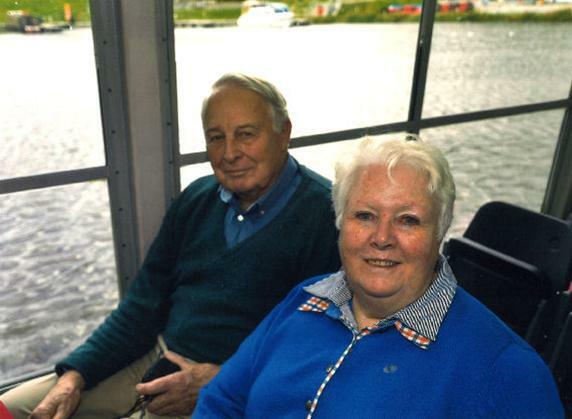 Here at the museum we take pride in our volunteers, without them we would not be able to function or offer the amazing friendliness and quality of service for which we are renowned. 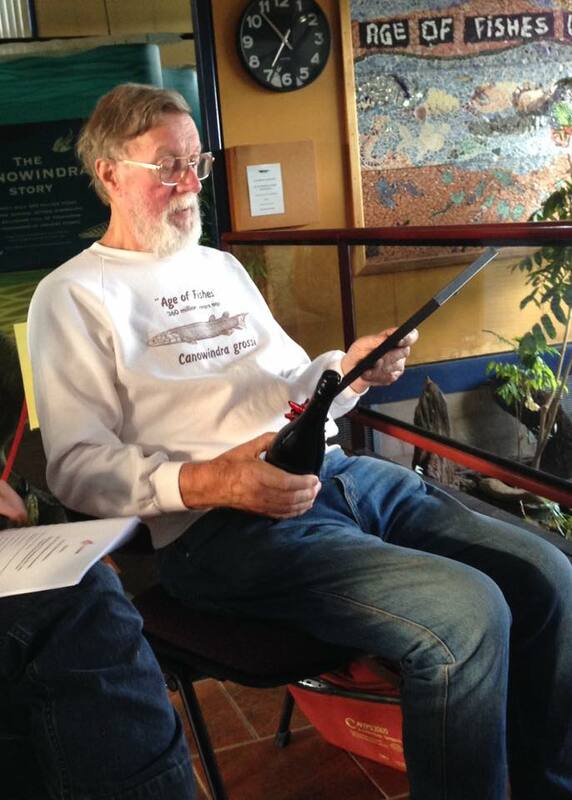 Our volunteers are the lifeblood of the museum. Susan’s hobbies include gardening and reading. If you are interested in volunteering some of your time or skills to the museum please let us know. We would love to have you as part of the team. We have recently made some changes to the retail area of the gift shop and now are focusing heavily on scientific and informative items. Now we have an extensive display of retail fossils that are sourced from five continents (I’m yet to crack Antarctica and Asia Ed.) This incredible collection ranges from Calcite Ammonites sourced from the beaches in the United Kingdom to 550 million year old local Australian trilobites, and fish fossils from around the world. 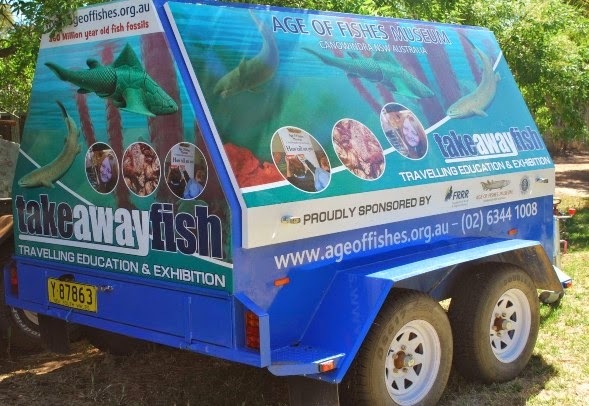 Our take away fish project has been completed and the travelling exhibition visits schools, other museums, and science festivals on a regular basis and is a huge hit with the kids. Most recently we were at the Australian Museum Science Festival in Sydney which saw thousands of visitors over two weeks. That’s all of the old news -- now for the new news and coming projects. We are currently in the final phases of having a new deck constructed at the rear of the museum. This will give greater access to our displays in a more continuous manner as well as providing some excellent space for outdoor seating and an area to bask in the afternoon sun. I will include some photos in the next issue of the newsletter. We also have a grant project underway to use some amazing 3D animation to bring the Canowindra Grossi to life. This is in the early planning stages and there’ll be more news as it comes to light. And finally our website is undergoing a facelift. Its new shiny version should be up on the internet very soon. 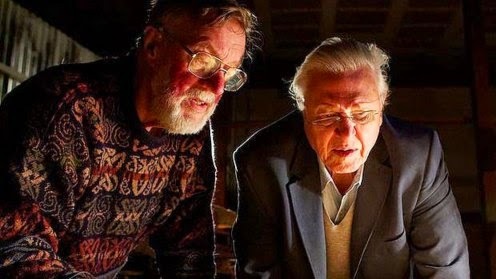 It will include such fascinating features as the full 4 minute interview with Sir David Attenborough at the museum, a timeline of events starting from the early Devonian to the present day as it relates to the museum, a kids only area featuring games and information as well as scientific information and the usual contact details. The early version looks great and once completed I am sure you will all be very impressed with the technical expertise our partners Ad- Loyalty have applied in this project. If you would like to write a letter or an article please forward to: Age of Fishes PO Box 360 Gaskill St, Canowindra 2804 or email us at aof@colourcity.com. 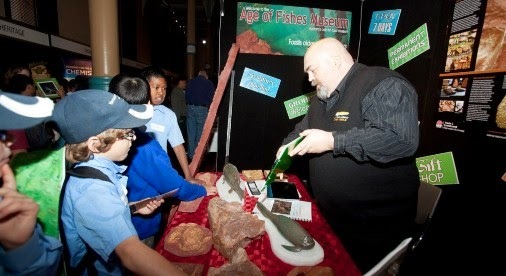 The Age of Fishes Museum has again been nominated for the Daroo Excellence in Business Awards! Congratulations on this nomination to all our volunteers, Friends of Fossils and the local businessand community members who continue to assist us in so many ways. The Museum could not continue to develop without your fantastic support. The results will be known after the Awards night in November and they will be noted in the next edition. This award was presented to Fiona Ferguson for the Age of Fishes “take away fish” trailer. As you can see from the previous article this is an amazing achievement. Our visitors never cease to amaze us with their comments. Here are a few Quotes from our Opinion Sheets and Visitors Book in recent months. planning to produce 4 each year . . . one for each season in this new format. We would love your feedback on the new look or ideas for future issues. Basically, I would like your expert opinions on what you want the newsletter to contain. 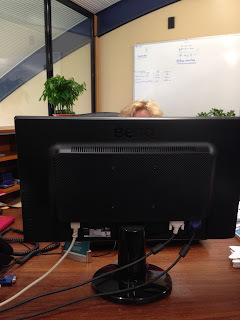 Is it meeting your requirements? . . . are you getting the information you want? Please feel free to email me with ideas or feedback at any time via our email address aof@colourcity.com. Your knowledge and your patronage of our museum is what keeps us going, and this newsletter is for you. Your opinion is greatly valued. 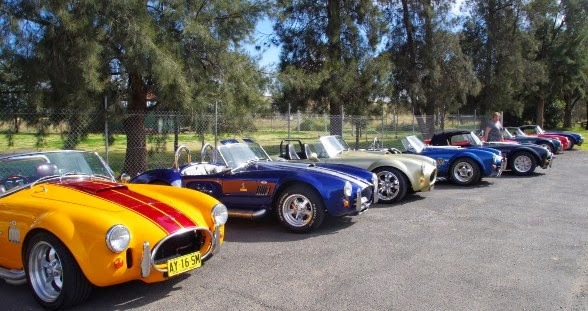 The Cobra Car Club of Australia visited the Museum on Monday 1st September. 18 cars lined the car park and surrounding streets, leaving many drooling at their immaculate condition. 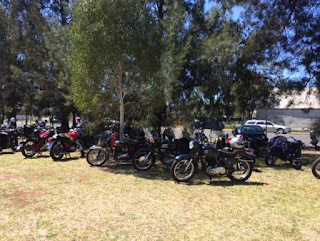 The owners were treated to a morning tea of homemade treats baked by Elaine Pearce and Beth Bowd, which were greatly appreciated by the club members. After morning tea the group wandered around the Museum, exploring the displays, and marvelling at the history presented within. Our car park full of Cobras!!!!! Old books always intrigue me. There is something about the smell, the feel and of course the language and with the current debate again raging in the news regarding evolution and life’s origins I thought it would be prudent to share an excerpt from a book titled “The Miracle of Life” by Harold Wheeler published in 1938. This excerpt is titled the TRUTH ABOUT FOSSILS. “Thus it will be seen that cataclysmic happenings may all but remove a species at a blow. Volcanic eruptions pouring lava over land and poisonous gases into the sea, were more prevalent in the remote past than nowadays. But for the most part races and species have declined gradually, and sinking back into the earth from which they drew their sustenance have become converted, circumstances favouring, into the mineralized replicas of their former selves known as fossils. How many commas were used in the writing of this passage let alone the entire 464 pg. book?